Reference number for this case: 17-Oct-54-Brusc. Thank you for including this reference number in any correspondence with me regarding this case. Information that we could not check told us yesterday evening that a saucer had been seen in Brusc. Yesterday morning, fishermen indeed were telling in the harbour that two of them were certain to have seen one of these machines evolving in the sky. We provide this information with all our reserves. Two saucers, that is really a lot. Unless it is the same one. What remains to be demonstrated. Not looked for yet. Insufficient information. 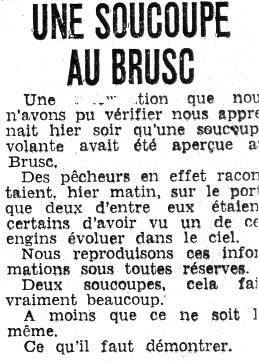 [vm1] Article in the regional newspaper Var Matin République, Toulon, France, October 18, 1954. 0.1 Patrick Gross March 24, 2005 First published. 1.0 Patrick Gross February 4, 2009 Conversion from HTML to XHTML Strict. First formal version.